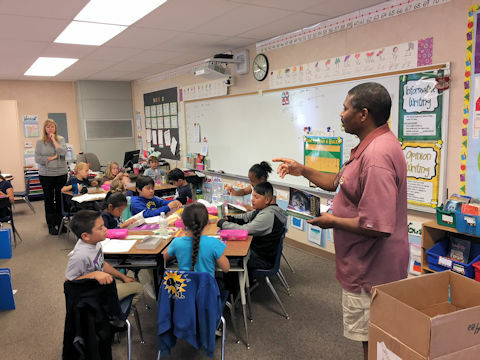 Members and guests of Rotary Ventura South participated in the 2018 Dictionary Donation Program, visiting eight third-grade classrooms at three Ventura Elementary Schools and handing out more than 300 dictionaries. The annual program was delayed this year by the Thomas Fire, but our volunteers made sure to complete the donation before the end of the school year. Pictured above is Bonaventure Wakam, making the presentation to a classroom at Portola Elementary School. Presentations were also made at Junipero Serra and Will Rogers Elementary Schools. Those making the presentations included Bob & Mary Davis, N.K. Khumalo & guest Debbie Senate, Bonaventure Wakam, and Sandy Warren. Those helping out with organizing and labeling the books included Bob & Mary Davis, Ed Keay, Sal Saldana, and Marilyn Scott.